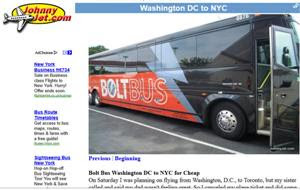 This is a great link to a story about travelling from Washington DC to NYC by bus and finding out it was much cheaper than going by plane, train or car. The article decribes the pros and cons of the journey and how much it cost. Overall it appears to cost about $20 instead of the hundreds of dollars that other means of transport charge and it can be just as convenient if you plan your journey.